International University of Business Agriculture and Technology (IUBAT) has celebrated the great martyr day and International Mother Language Day with due respect in memory of martyrs of Language Movement. The program started through hoisting of National Flag to half-mast in the morning by Prof. Dr. Abdur Rab, Vice-Chancellor, Engr Wasil Hasan Chowdhury, Secretary Board of Trustees, Pro Vice-Chancellor Prof. Dr. Hamida Akhtar Begum in presence, Treasurer Prof Selina Nargis, Registrar Professor M Lutfar Rahman, Deans, Chairs, Coordinator of faculties, students, officers and staff including entire rank and file of the university community. 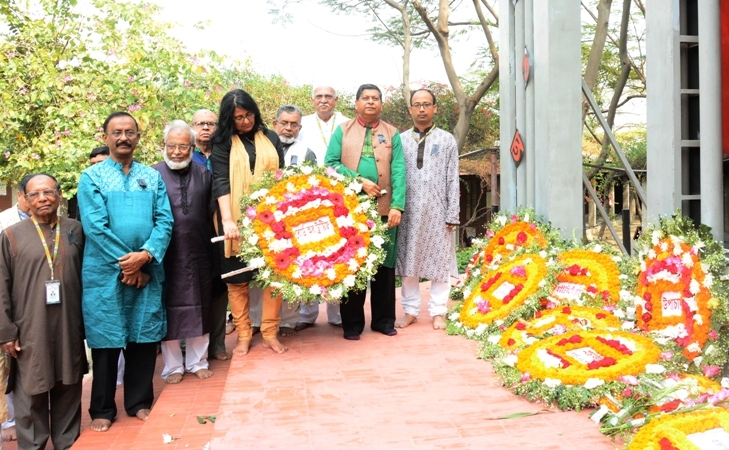 IUBAT Vice-Chancellor, Members of Board of Trustees, Pro Vice-Chancellor, Registrar, Faculties students honored the language martyrs with flowers in the Shaheed Minar of the University. Later, a discussion meeting was organized in the IUBAT auditorium to commemorate the martyrs. After the discussion, the cultural programme began with two chorus songs including Amar Bhaiyer Rakte Rangano Ekushey February. Poem recitations and group dances were also performed at the programme. IUBAT Deans, Chairs, Coordinator faculties, students, officers, and staff were present the program.